It’s 2018, and numerous of the operating system, available on the internet. No doubt in this, Windows is the most widely used operating system. But it doesn’t mean that other Operating Systems are not Good. If you are planning to switch from Windows to Mac, then maybe you are looking for a way, to try Mac OS. Or maybe you want to use some mac software, which isn’t available for Windows. Whatever your reason is, at the end, you want to run Mac on Windows. 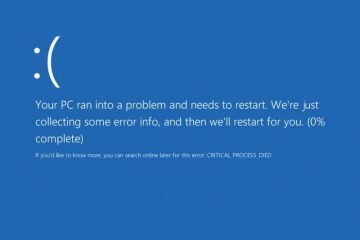 The first time, when I thought to install MacOS on Windows, First thing that came to my mind was – Is it possible?. Officially Apple doesn’t provide any ISO file of Mac OS, But you can get it from some third-party sites. There are two ways to install and run MacOS on Windows PC. IMPORTANT – Before you try any method, the first thing you should know that – Apple’s license for macOS, not allows it to be installed on the non-apple hardware. First Method – Build a Hackintosh. A Hackintosh is a non-apple hardware, that act like Apple hardware and made to run macOS. It could be manufacture made, or can be built computer personally. After setting up hardware, the next thing is – Create a bootable drive to install Mac OS. Note: But you can create bootable drive only using MacOS, with the help of UniBeast. That’s why I don’t prefer this method to run Mac OS on PC. Second Method – Create MacOS X virtual machine. This is the best method to run Mac on Windows, you don’t need a Mac or MacOS hardware. And, the best part about creating the virtual machine is, you don’t need to remove your current OS and no external drive required. What things you”ll need, to run MacOS on Windows PC. 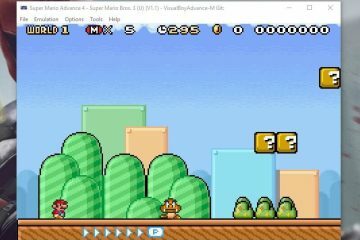 1 Run mac on windows. 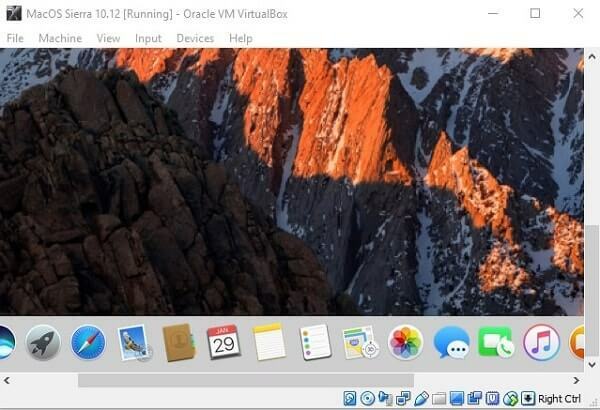 1.1 Run virtual mac on windows – VirtualBox. 1.1.1 Run Mac OS X Virtual Machine. 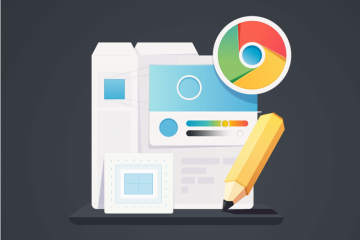 1.2 Conclusion – Run Mac on Windows. 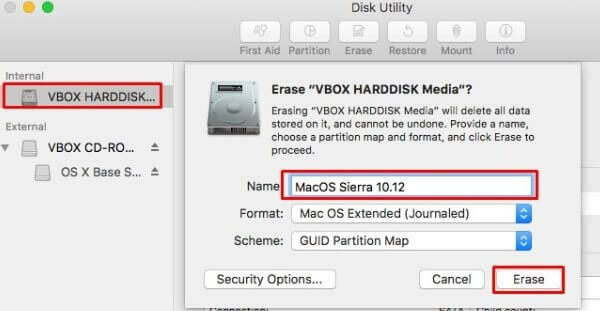 This method will work with all Mac OS ISO file, And in this article, I am using Mac OS Sierra 10.12. Run virtual mac on windows – VirtualBox. 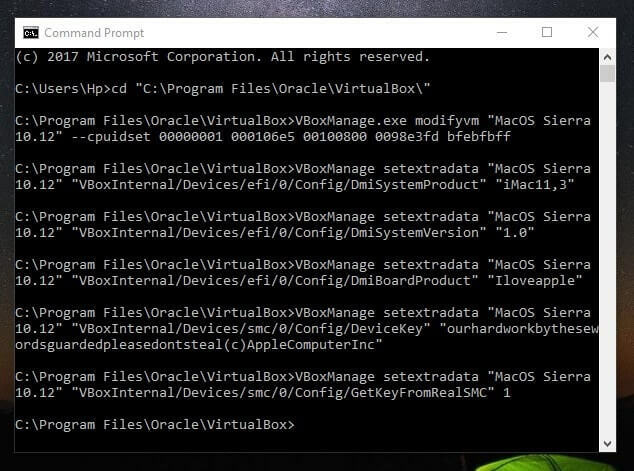 Step: 1 Download and Install VirtualBox software on your Windows Computer. Now open it, and then click on the new button to create a new virtual machine. 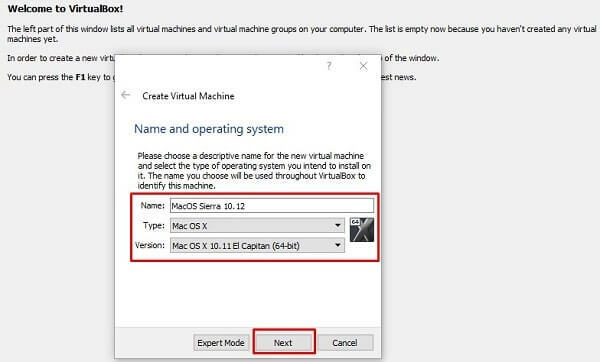 Step: 2 Virtual machine installation setup will ask you to enter machine name, OS type, and version. Note: Always choose the lower version of available ISO file. And if you have 32-bit OS ISO then choose 32-bit version. Here I have Mac OS X Sierra 10.12 version, that’s why I am selecting 10.11 version to run OS smoothly. Step: 3 In next windows, the virtual software will ask you to select RAM for the virtual machine. The minimum RAM required to run Mac on Windows is, 4GB. 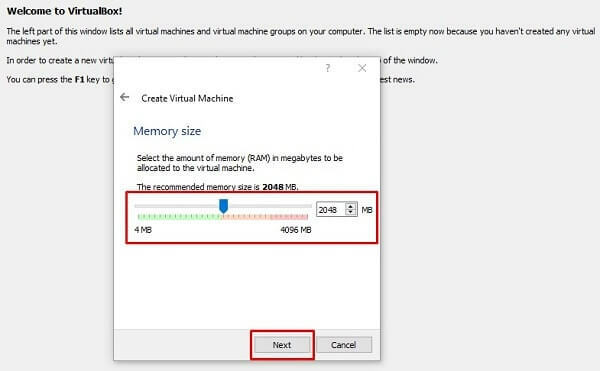 But if your computer has total 4GB RAM then you can allocate 2GB (2048 MB) to the virtual machine. Step: 4 After selecting the RAM, now time to create a virtual hard disk. 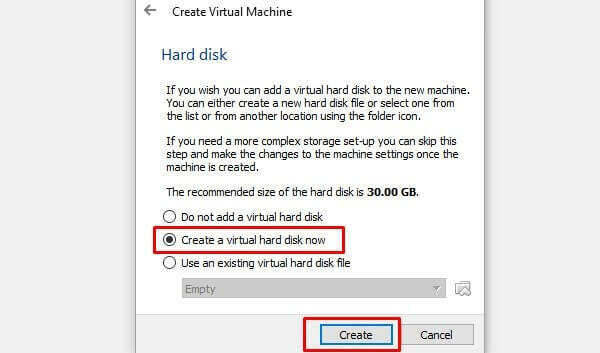 Select “Create a virtual hard disk now” option and then click on Create button. 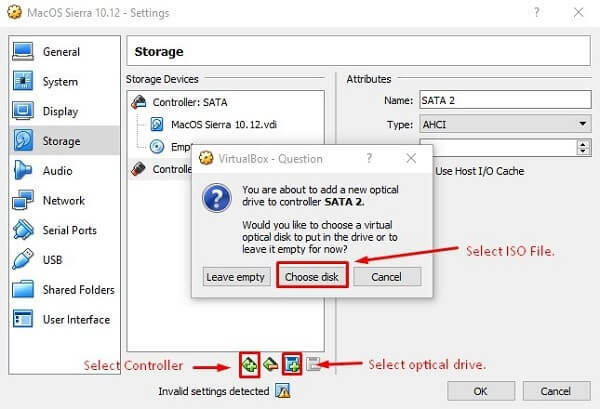 – Choose VDI (VirtualBox Disk Image) and click on next. – Choose Dynamically allocated and click on next. 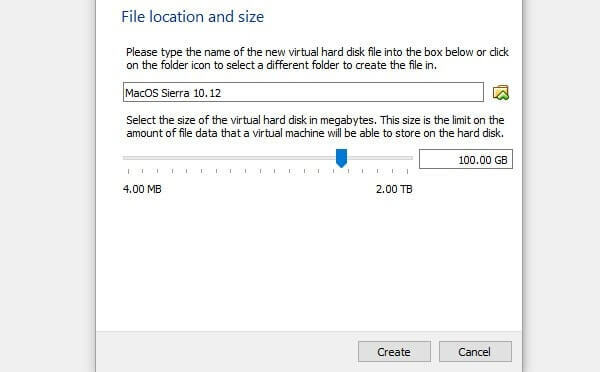 Now, setup will ask you to allocate hard disk size, You can select between 50 to 100 GB, then click on next. Step: 5 Right-click on created Mac OS virtual machine, and then select settings option. – First, Click on system and unmark floppy option. 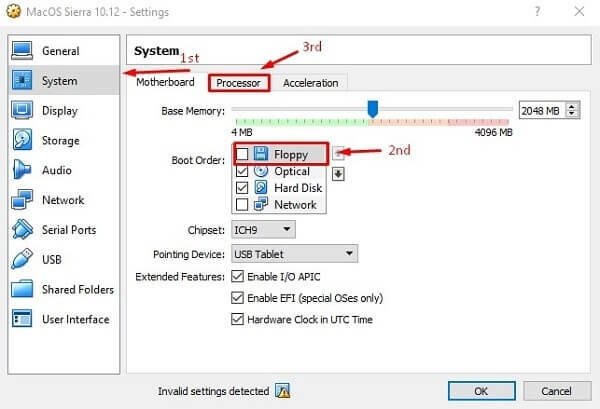 – After selecting 2 CPU, Go to display settings section and select 128 MB video memory. Step: 6 Add ISO File – Click on storage devices then you can see the empty option, right click on it and then choose “remove attachment” option. – Click on “+” icon to add new storage controller and then select Add SATA Controller to add. – Then choose the third option to add new storage and then choose “Add Optical Drive”. – Now use “Choose Disk” option to select Mac OS ISO file that you have downloaded, Click on OK. If you have download MacOS files from my link then you”ll get VirtualBox VM settings text file. To run Mac OS without any error you need to apply settings mentioned in that text file. – First, open VirtualBox VM settings text file in notepad++. – Press Ctrl+F key and then click on Replace button. To apply these settings, which appears in the text file. 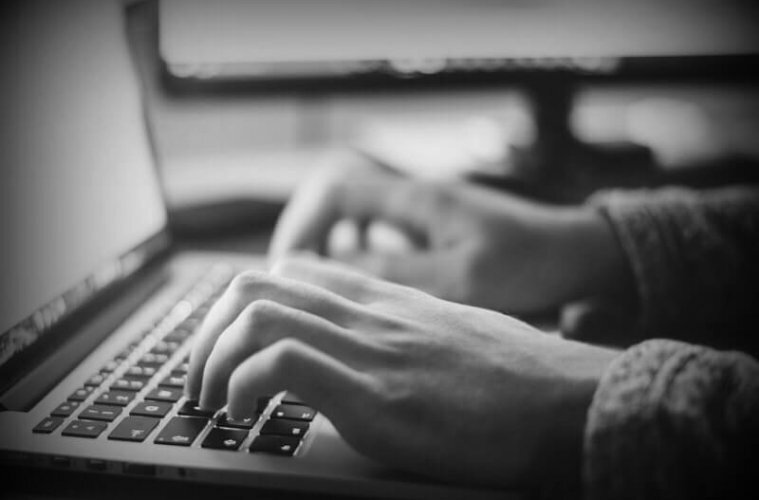 Open the command prompt and then copy and paste these commands, one by one and press enter. Run Mac OS X Virtual Machine. Note: Close all other running windows program, While using Mac OS virtual machine. – Select “Use English for the main language” option then click on start button. – Now, from MacOS file menu, select Utilities > Disk Utilities > Click on VBOX HARDDISK MEDIA > Click on erase button > Enter OS Name (MacOS Sierra 10.12) and click on erase button. After erasing VirtualBox hard disk, close utility menu, and then click on continue button. On next windows it will ask you for license agreement click on Continue> then click on Agree button. Now, Disk selection menu will appear, choose macOSSierra and Click on Continue. 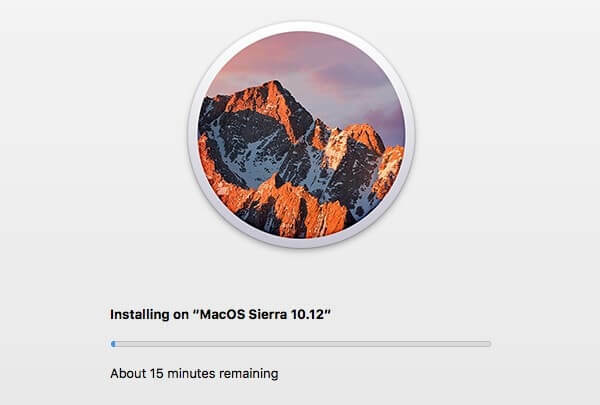 After clicking on continue, the installation process will get started, and it will take minutes or an hour according to your computer hardware. When installation process gets completed, Mac OS will ask you few things like – Country, Keyboard language, Location services, and Apple ID. Set all things and then you can use MacOS on your Windows PC. Conclusion – Run Mac on Windows. This is the best method to install Mac OS on PC using Virtual Machine. If you follow complete guide properly then you will not face any error. But if still, you face any issue while installing or running Mac OS on your Windows PC then, you can comment. And, If you like VMware Workstation then you need to apply different settings using the command prompt. But I suggest you, to use VirtualBox because Mac OS installation is easy with it. Previous ArticleBest WhatsApp Business App features – How to use. Next ArticleHow to get GarageBand for Windows 10 – GarageBand Alternative. I am sure i followed each and every step. And my pc is compatible. I have already tried reinstalling.Also tried uninstalling antivirus. Mine seems to go well through the installation then right at the very end it reboots and locks up and nothing happens. If I power off the virtual machine and then back on, it goes through the whole installation process again and then same thing. what’s up?